* in the WritingMaxExternalsInJava.pdf doc : "For timing sensitive events the js and jsui objects should not be used"
C is still faster. '1.5 times' is not an absolute measure for everything... and it can make a big difference very fast in the development of larger apps. also, you develop C externals outside of Max, true, therefore you have to restart, but to me it's a negligible amount of time, when people talk of 'slower development time' for C, that's completely subjective: usually more true for those who are just plain slow at using their IDE and at programming in C.
It is good to hear your passion for Java, though! I guess it really depends what you are trying to achieve. I have and do use all three. I don't think there is a good argument for only using one. If you (in many cases meaning me) are really serious about efficiency then C is probably the best way to go. 1.5x might be significant if you are writing audio code that is already expensive. Java has cross-platorm on it's side (that's the big plus for me).The garbage collection is a lot easier, but I'm not usually worried about cross-platform - I know the C API very well, and I can deal with garbage collection, so normally the speed wins out - when compatibility is a concern then java is normally my choice. The last thing which you fail to consider is the API available in each. One of the quirks of developing for max is that the APIs are all different. That means that sometimes it's really straightforward to do something in one, and not in another. Let's say I want to read a textfile without character limitations in. I did it in js in less than 20 lines. I don't think I've ever written an external in java or C that was anywhere near that compact. Noob4Life, you are right about C efficiency can be better than '1.5 times' specially for block calculation (audio externals, jitter). Sorry I don't have the intel version compiled for the C test because it was made for me by a guy at ircam five years ago. I doubt the '1.5 times' would change a lot anyway. > AlexHarker : "I can write a quick routine in js in under 2 minutes > and have it running. I doubt I could be as fast in java, even working from a template. > One of the quirks of developing for max is that the APIs are all different. By the way. I'm not sure I believe your figures totally. Assuming my figures are right (which they may not be) that would somewhat change everything no? ++ to mxj supporting pattr integration! Hoping it is coming soon. Yes AlexHarker, It was necessary to put this /10 for js and *10 for java and c, in order to avoid: 1- minutes to wait for the js to compute, 2- eventual bad precision over java an C if the test is too short. Then the compute time is corrected by multipling by this factor. (third [chrono] inlet in my patch). Sorry if my test then looks a bit complex. >> ++ to mxj supporting pattr integration! Hoping it is coming soon. Do you really think that could come soon? This would be nice. But looking at theses old topics ( https://cycling74.com/forums/pattr-support-in-max-5 and https://cycling74.com/forums/notifyclients-in-java ), it doesn't look like coming soon. Yes - I guessed as much once I'd figured that out. I get about 160 times faster here on a dual 3.0GHz MBP. I've broken the law. rehabilitate me. someone! I've been trying to get started with C/Max for 5 years now. never got off the ground. Why? The thing I've had problems with in every language isn't the language part but the way it's set up on in the OS. There are never any details about it in any tutorial. There's always a line "find foo.baz.clib on your drive" and it's never there. I've spent four years programming mxj externals and I have no frick'n clue what ANT is, how to write scripts for it, or where "java" is on my drive. I open eclipse, include max.jar and I'm done. Maybe that makes me not a "real" programmer. I couldn't care less. I'll try again soon when I get around to installing snow leopard but setting up max and C has taken weeks of my life and I've never gotten it right. I have used JS to develop two or three projects. As most of them were non -realtime I didn't care about efficiency. I chose JS essentially because I wanted to use the drawing capabilities of the JSUI object and because as a non-programmer (I mean no experience in any formal language outside Max, SuperCollider and GW-Basic). I also wanted the shortest possible learning curve. 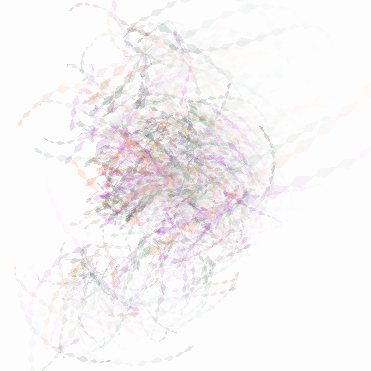 I had one project to create rhythmic patterns using JS. Reading the resulting data in real-time with JS produced tons of clicks while reading them from colls worked correcly (althought transition between Max4 and Max5 showed some reductions in performance for very fast MIDI rhythms). I have been thinking about learning C several times but I always postpone it. > but in small applications I think you might find that worrying about cpu usage is a waste of energy. The problem with small applications, is that they often get bigger, or that one day you need to load a bunch of them for a live or something, and then nothing is working as before and you don't know why. If MaxforLive already included LiveAPI integration for Java, I'd be on the bandwagon...for now I'll code it in js and convert it when it needs done. My personal experience of double precision critical situations is more in the domain of audio rate programming admittedly, but that is just me. You seem to be suggesting that doubles are unnecessary. I'm trying to suggest that everyone's needs are different, and if java is twice as slow with doubles (that is inline with what I expected) - then on my computer you are looking at closer to 75 - 80 times slower for js doing the same thing - which is a substantially different figure to 200. Sometimes the speed gains offered by C *really* matter to me, whereas to you it isn't worth it. As for arrays - sure - I didn't say it was fast, or good for that. However, in the event that you do very little in a function call and you make the function call lets say every 10ms (which is really quite often compared to a message-based musical timing) - the CPU you might be talking about is really not worth worrying about. Often I am using js for one off calculations / loading processes / things that happen maybe less than once a minute. Unless those operations are noticeable intensive then optimisation is not a concern. Alex wrote, "Often I am using js for one off calculations / loading processes / things that happen maybe less than once a minute. Unless those operations are noticeable intensive then optimisation is not a concern." ya, this is what i was trying to say... for such contexts, a quick scripting language(like JS/Python/etc.) seems better than any small efficiency gains you get from a lower-level language. Oh please, the days of low-level languages for general purpose programming is over (should be anyway). Using C as an application language was never a good idea and still isn't. It was designed for system programming, and that is were low-level concepts such as direct access to memory should stay. The programming platforms of the future are probably going to be virtual machines supporting dynamic linking, JIT-compilation (which already beat AOT-compilers in speed) and garbage collection on the fly. @Noob4Life I have no problem using and relying on stable software. What concerns me is that the performance arguments is used to hold back the emancipation of new and better languages. I think it should be the other way around, we should look out for more expressive ways to program and then consider implementation. Of course Max was designed to connect C programs, that was the the accepted way to do real-time back then. Now we have other options, there are hundreds of languages with safe memory, lambdas and dynamic dispatch that are fast enough for real-time, many of which can be integrated in Max. "I think it should be the other way around, we should look out for more expressive ways to program and then consider implementation." well put! after all, all 'languages' serve the primary purpose of communicating and disseminating any form of information(efficiency concerns are not always paramount to communication). if we talk of the future, i believe all apps and data will be web-based eventually, and personal comps will only be a terminal to that network, this will actually be more affordable and will provide better access to information for even 3rd world countries... sounds dangerous to comprehend at first, but since i don't think google/verizon/microsoft will ever succeed in completely limiting/commodifying our access and presence on the web, it's very possible... therefore, i agree with all your statements of what options we have and will have. I have never really understood why people want to do time critical operations with Java. As a software developer designing a real-time system, the last thing I want to build into it are unknowns like garbage collection and byte interpreted instructions. That just adds unknown inefficiencies that keeps you from squeezing all the power you can out of your system. Max is an open architecture that allows you to insert your own objects in that audio and data signal path. It is supposed to be as efficient as possible. Implementing your algorithm in C is probably the best compromise between readability and effecienncy. "python is a much better language. I hope that one day, Cycling74 will add native support" +1 4 Python! @Anthony Your arguments are just not valid. The JVM of 1990s were slow, modern implementations are not. GC and JIT are not "dumb overheads" but higly intricate compilation techniques that may actually yield better performance than a C compiler. That JVM's are slow is just a plain old myth. What Java has is a slow startup time (about 500 ms on my machine, and this happens once when you load your first Java class). This is not because of JIT, but because Java links everything dynamically. The benefits of this are so huge that I have no problems with a split-second startup delay. Furthermore I would argue that in a real-time application stability is more important than raw performance. In Java code you will never have a memory error except if you mess up concurrency. Use Clojure and you will not even have that. Also, why should we need to compromise readability to have efficiency? Why not use a language that has both? (Not that Java does). >> Why not use a language that has both? Good question. "I would argue that in a real-time application stability is more important than raw performance. In Java code you will never have a memory error except if you mess up concurrency. Use Clojure and you will not even have that." You obviously know your stuff, and I respect your opinion, but this argument at least is void if the programmer deals with memory allocation and access correctly. Also, as always YMMV with regards to the importance of raw performance. As we are dealing with a real time audio language here, and portable computer power is not infinite, I think it is clearly arguable that in some scenarios available processing power limits what is desirable, and therefore raw performance is highly relevant. In time critical situations 20% (as quoted in the linked article) slower may simply be unacceptable. In reality I simply don't believe that 20% is a typical figure for what is being discussed here (max external in java vs one in C). I'd be happy to be proved wrong, but I'll be sticking to C for efficient audio processing until then. "A properly written Java signal processing external is typically about 1.5-2.5X slower than the equivalent external written in C. A lot of this depends on what sort of processing your external is doing. In most cases the more computationally expensive your external, the closer that the Java and C versions will be in performance. This is because the biggest overhead introduced by doing your signal processing in Java is in the context switching that occurs when the mxj~ bridge calls from C into your Java signal processing routine. The cost of this context switch is amortized across the amount of time you spend actually accomplishing your task, so the more expensive your task, the less relatively expensive is the cost of the context switch." I think what everyone is doing here is only proving that developers are extremely high-maintenance people ;) The discussion is whittling into something uninteresting and convincing me to stay away from Java(since devs in that environ seem more desperate to talk sh!t about all others more than anyone else i've seen). What you've convinced me of, is that even though you don't think it's significant, C is still significantly faster than Java(because 1.5-2.5xfaster can make a very big cumulative difference to me). With all due respect Hans, I definitely see the merit of your argument. Java VM technology has certainly advanced in the last 10 years. But I feel a lot of these benchmarks people quote are perfect scenarios that don't really reflect the real time performance environemnt of an integrated system (memory latency, kernel i/o, graphics/audio interfaces). You can argue all you want about how some JVM does an FFT faster than C, but put it in a real world environment and I think you'll see different results. Arguable the most complex real-time audio/graphics system out there are console game systems like the PS3 and Xbox. Why hasn't Sony or nVidia, chosen Java as their development language/environment of choice? Because it is an inefficient language for that environment. Having done video game development for 7 years now, I know for a fact the tremendous work that goes into squeezing every drop of processing power out of these systems. You are interfaceing with DSPs, GPUS, pixel/vertex shaders, etc. Implementing things in Java would be a joke, I mean really. Why would I not want my Max patch to perform at the same level? To make it clear: I am NOT arguing anything against C. I just mean that to write externals, Java is almost as great - and really more simple to use in my personal point of view - in most of the situations that i encounter. Sorry, I would add 3 words to this sentence from my first post, which some can find provocative, if i could : "Now Java is about 1,5 slower than the C test (non-block-calculation), which, FOR MY PURPOSE, in most situations, is almost nothing." C is great, Java is great, Max is great, MMF for Ipad is super Great!, and we are all great people! "I was just screwing around :-)" no one blames you, either, it's getting hard to take this thread seriously. Implementing things in Java would be a joke, I mean really. I think this is still the old prejudice, but no matter. Performance of JVM for critical tasks has and will countinue to be widely debated. Of course Max is fundamentlly a native environment and integration with any VM can never be entirely smooth. @DiGiTaLFX Agreed, there are many promising new implementations. Personally i use Mozilla's Rhino and compile to JVM bytecode which runs like lightning. I am not doing real-time audio in it though ;). @Hans I've been checking this out....how much Java do you need to know to work in this manner? I am also not doing RT audio, but I need faster processing for arrays and such...I'd like to start working on some flocking/algorithmic stuff and the last time I did this sort of thing in js I ended up having to rewrite the whole routine in pure Max b/c it was just too slow...I'm thinking this might be a nice alternative, without having to spend the extra time on the front end learning a new language. > " the extra time on the front end learning a new language." Does this look that much more complicated ? @alexandre agreed! Do you have the same code in C? I'd love to see a side by side comparison of all three languages. The code in C, "calcultest.c", is in the "Efficiency-Tests-Nov2005.zip" attached above, in the first post of this topic, although i think that it could really be shorter (not made by me - i don't use C - but by Diemo from Ircam 5 years ago). * But you do need to learn a bit about some java stuff: primitive types, operators, cast, arrays and Java.Math class if need some math. This is 10% of my java learning book. If it's difficult to imagine what *60 or *400 really mean, have a look at my modified version of Flies.maxhelp attached. Anything like this in a js object is, from far, impossible. Nope...that doesn't look that much more complicated....but I'm guessing that everything I would normally do in js isn't going to translate quite as easily. I've gotten used to the way js types variables, and I know how its integration with Max works. Besides: a lot of the stuff I need to do, I've already written scripts in js for the routines. Being able to convert already written scripts fairly easily with something like Rhino sounds very convenient. I will learn Java...its merely a matter of when I will have the time. I'm also trying to tackle Python right now (and I have a more immediate need for it), which is all that much more confounded by the lack of a decent way to test in Live (I'm working on control_surface scripts). Plus, it goes back to my original post: since the majority of my work is with the Live API at present, there is no facility for accessing those objects directly with Java, nor any speed increase since the API can only be accessed low-priority. a thousand times yes. v8 with commonsjs modules support please :D ? Probably not V8, since it doesn't support multithreading, and would require a complete rewrite of much of our code. Jaegermonkey is the one we're watching. Lets of great work happening there, and it's coming close to Nitro/V8 performance. Nice discussion, very enlightening to hear such interesting opinions. For me java provides the big advantage of the possibility of reusing code and the access to very interesting libraries, such as those coming from Processing. I would love to see a more supported class-oriented approach on the SDK. Besides efficiency it is interesting to think what kind of new technology can be implemented or bridged inside max(i am thinking of openCL or the quartz technologies, for instance). Would be interested to see if someone could port the test to jit.gl.lua object. mmmmmm :) That's good news, I'd love to hear some further confirmation of this....I've started doing stuff that needs to be fast in Java, but I still prefer the ease of js, and use it whenever possible. On the other hand, how much of the stuff that I reserve for Java (for speed) will be possible with ~gen now, I wonder? Just a quick comment and examples. Hopefully to illustrate some best practices in JS for improved performance. These JS files you've provided make heavy use of global variables, and even then ones which haven't been scoped with var, The former are slow, and the latter are even slower (and dangerous since they are values shared between instances). This is true for both the older spidermonkey JS implementation, as well as the new JIT compiled Jaegermonkey implementation. And in the new engine it's even more important for optimal JIT performance. I've taken a brief moment to revise your examples just comparing your JS with some improved JS files. Also, some of your examples had codepaths which could possibly be eliminated (e.g. a large loop which sets one variable over and over again, so in effect the only one necessary to set is the final loop value, or if those values are never used in the future, they don't need to be set at all). So they might not be accurate tests of read/write performance, but rather a test of deadcode elimination. I didn't have time to investigate whether or not this is the case. Finally, also when testing you need to execute a function a few times before JS will completely JIT compile, so be sure to execute a few times to get the optimum JIT compiled benchmark. That said, Java will be faster than JS. No question. I don't know of any of the new JS implementation which are as fast as the JIT compiled Java VM. Part of this is because of static typing and other language features. Anyway, not trying to get into any language better than another conversation. While I personally mostly code in C, I'm language agnostic. Each language is great for its own reason. Thanks Joshua for those tips! It makes sense that the assumption that the most efficient way of doing something in one language would be the same in another is actually wrong now that I think about it! 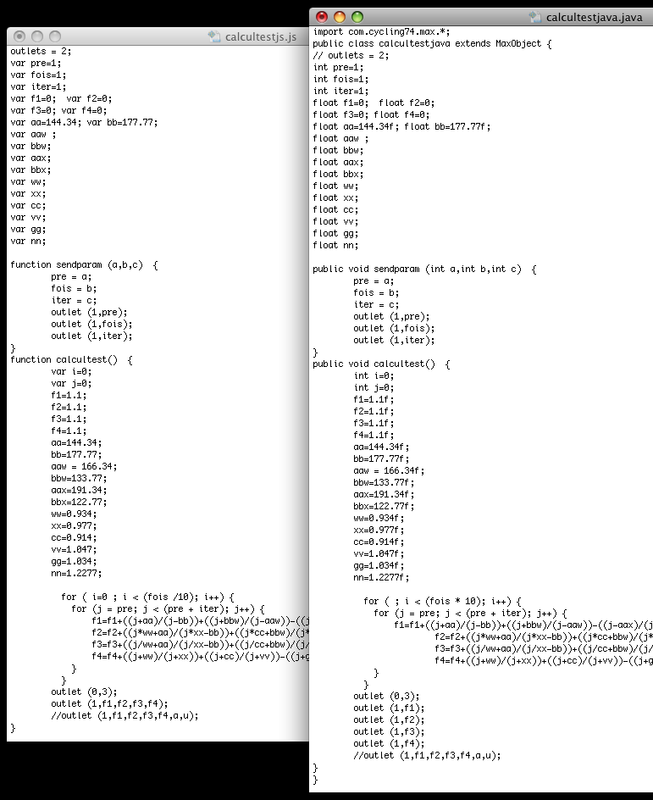 So I decided to try run the calculations test in jit.gl.lua for a comparison there too. I've ported Joshua's revised js test to lua (as I believe lua likes local variables too) and have attached to the post. This doesn't surprise me too much. The JS object in Max6 is using a JIT compiler, which are good at optimizing math in tight loops. jit.gl.lua is using the stock Lua interpreter, which isn't JIT compiled. If JS was still using a non-JIT compiler, jit.gl.lua would be faster. There is a LuaJIT project, which is blazingly fast, particularly for these kinds of tests. If jit.gl.lua was using that, it would be as fast if not faster than JS in Max6. I'll add a feature request for LuaJIT. ** I though about using pattr, but we prefer our "little-abstractions" system for several little reasons, two of them being that you cannot directly dump value changes in one place from hundreds of scripting-named objects without also writing a c-external for that, and that pattr have the reputation to be slower that [send] and [receive]. Do you know if anyone has given any thought to implementing Google's v8 interpreter? Seems like its 8-10x as fast as spidermonkey. How hard would it be to make an external that references and autowatches a js file or an mxj with something like jav8?